Vacation season is in full swing with the summer sun distracting workers of all stripes with daydreams of getting away from the daily grind. At the same time, small business owners continue to be besieged, as ever, with a tidal wave of responsibilities, small hassles and unmissable obligations. The collision of these two realities could equal frustration, but according to a new survey from Cisco, the result is actually a happier one – more remote work. The recent poll of 500 U.S. small business owners uncovered that large percentages of these entrepreneurs are relying on remote work to balance their need to get away with keeping their companies running smoothly. 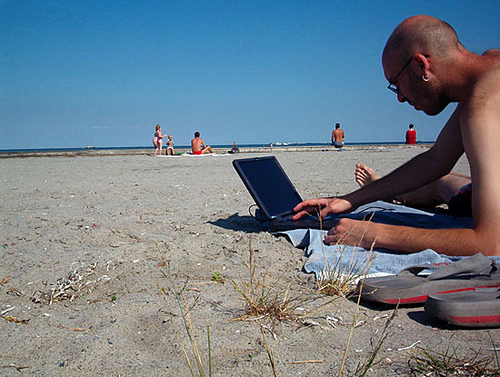 On average the respondents plan to work remotely 18 days over the summer. Fifteen percent plan to work remotely 36 days or more, while nearly half of owners plan to work remotely for at least two weeks. One in four stated their companies rely on telecommuting. What’s also clear is that small business owners, freed from the bureaucratic hassles of larger organizations, find plenty of benefit in remote working and manage to make leading at a distance work for their teams. All of which suggests that the what’s holding back remote work at big firms is more a matter of culture and inertia than logistics. Image courtesy of Flickr user uros velickovokic.